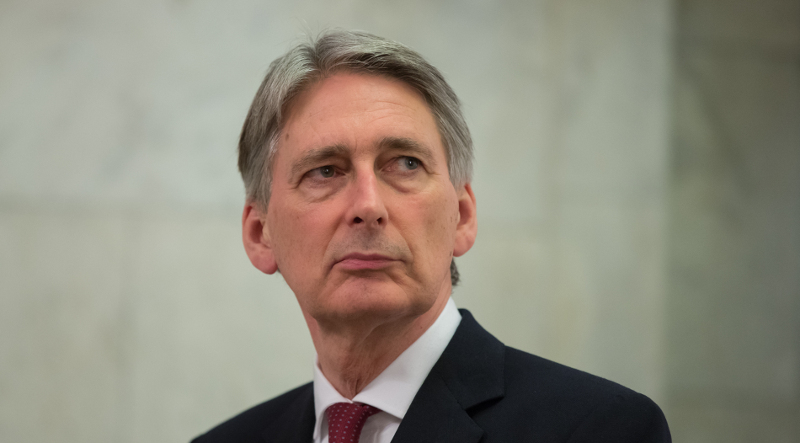 Unheralded by Philip Hammond in his speech, this year's Budget contained an alarming announcement for renewable energy: there will be “no new low carbon electricity levies until 2025”. 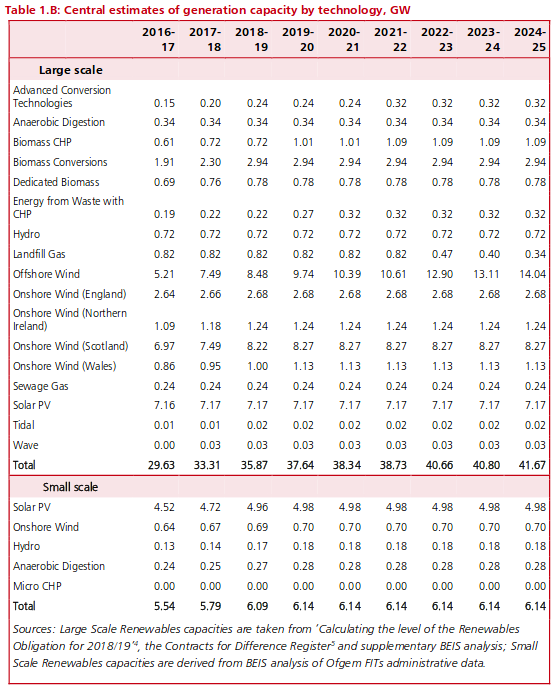 Commitments made in the government ’s Clean Growth Strategy will not be affected: existing Contracts for Difference (including Hinkley Point C) and existing commitments under regulatory schemes such as the Renewables Obligation and Feed-in Tariffs, and up to £557 million (in 2011-12 prices) for additional Contracts for Difference (most of the latter to be spent on offshore wind). There are possible get out clauses - new levies are possible if they will 'have a net reduction effect on bills', so energy efficiency measures or subsidy free contracts could be allowed. Solar energy and onshore wind (if it is allowed) might just manage subsidy-free. But what about other renewable technologies with long-term potential? The announcement puts another question mark, for example, over the future of the Swansea Bay Tidal Lagoon project. What if wind energy just needs a small subsidy to manage (and would still provide cheaper energy than nuclear)? At a time when decisive action on climate change is more desperately needed than ever, this budget is a massive backward step and a missed opportunity to demonstrate that the recent Clean Growth Strategy was not just rhetoric. The Green Alliance sum up the budget neatly as "a picture of grey indecision, not green growth", and points to calculations that a push for renewables and efficiency in the budget could have saved consumers £1.7 billion per year by 2025, and £5.3 billion by 2030. Alongside this, Treasury predictions also make concerning reading. Forecasts are given for generation capacity for low carbon electricity projects supported under government schemes (so excluding any that might be built with zero subsidies). For all technologies except offshore wind, the Treasury is predicting that government schemes will lead to new capacity during 2020-25 of more or less... zero. For those inclined to play 'spot the difference', this is not exactly the picture that the recent Clean Growth Strategy was selling. The first table below is from, Control for Low Carbon Levies. The second shows additional capacity from the previous year, calculated from the first table. 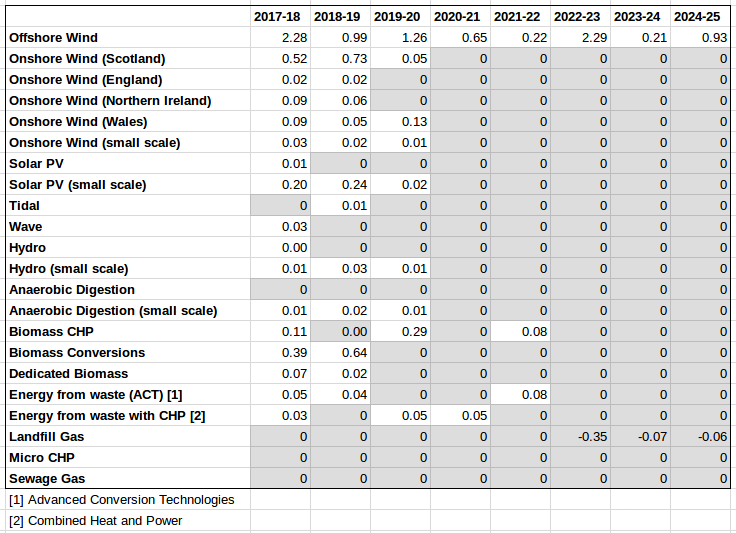 This shows even more clearly the Treasury's predictions for no new low carbon capacity to be supported by government schemes in the first half of the 2020s except for offshore wind. This looks like either binning renewable growth or a massive gamble on the renewable industry's ability to deliver subsidy-free (and possibly with new onshore wind in England still ruled out). 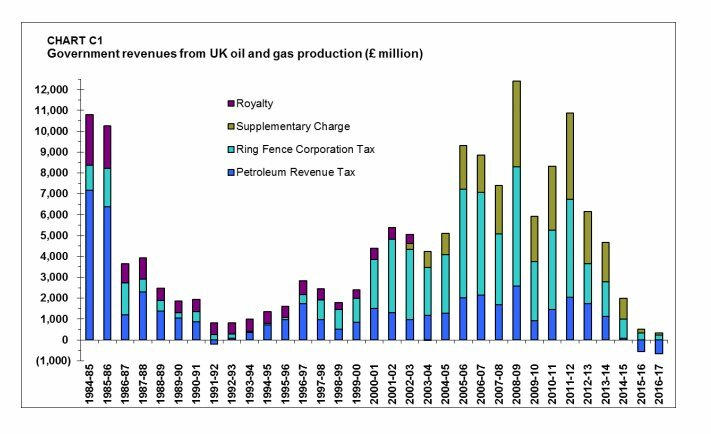 Yet another tax break for North Sea Oil, which has for the last two years already a been a net drain on the public budget (chart right from here, via @LeoHickman). This was described as “an innovative tax policy that will encourage new entrants to bring fresh investment to a basin that still holds up to 20 billion barrels of oil”. There was support for electric vehicles in the budget: £400m more for EV charging networks, £100m for sales incentives, more tax breaks for corporate uses, and more money for R&D. But for the eighth year running the fuel duty was frozen - a policy that has cost the Treasury £46 billion over that time, and contrasts strongly with the Chancellor's statement, "We owe it to our children that the air they breathe is clean." As does the limited nature of diesel disincentives. The increase in vehicle excise duty on diesel vehicles – a tax paid when vehicles are bought – would amount to an increase of just £20-40 for a typical family car, up to a few hundred for the biggest cars. And it was made clear that vans would be exempt from this. As Caroline Lucas pointed out on Twitter, to give this some context the cost of driving and domestic flights have both decreased by 16% by 1997, while the cost of taking the train has increased by 23% and buses and coaches by 33%. Finally, there was a welcome promise to "investigate how the tax system and charges on single-use plastic items can reduce waste".